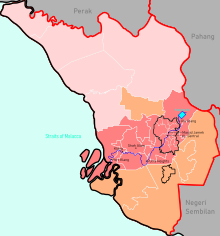 Principal cities within Klang Valley within the borders of the state of Selangor and the federal territories of Kuala Lumpur and Putrajaya. Klang Valley (Malay: Lembah Klang) is an area in Malaysia which is centered in Kuala Lumpur, and includes its adjoining cities and towns in the state of Selangor. A more recent alternative reference to this would be Greater Kuala Lumpur. The Klang Valley is geographically delineated by Titiwangsa Mountains to the north and east and the Strait of Malacca to the west. It extends to Rawang in the northwest, Semenyih in the southeast, and Klang and Port Klang in the southwest. The conurbation is the heartland of Malaysia's industry and commerce. As of 2012, the Klang Valley is home to roughly 7.9 million people. The valley is named after the Klang River, the principal river that flows through it that start at Port Klang and end at Hulu Klang, which is closely linked to the early development of the area as a cluster of tin mining towns in the late 19th century. Development of the region took place largely in the East-West direction (between Gombak and Port Klang) but the urban areas surrounding Kuala Lumpur have since grown south towards the border with Negeri Sembilan and north towards Rawang. KL Sentral, the transit hub for the Klang Valley and possibly the entirety of West Malaysia. Even though the Klang Valley officially consists of separate cities and suburbs, integration between these cities is very high, with a highly developed road network and an expanding rapid transit system. Many expressways criss-cross the metropolis making cars the most convenient way to get around. However, this has led to the Klang Valley's notorious traffic jams which span whole kilometres of expressways and make driving during peak hours exhausting. Since the 1990s, new rapid transit systems, such as the Rapid KL's light rail transit (LRT), KTM Komuter and the monorail have been developed. Most of these systems have gone through extensive expansion as a superproject, in which the two LRT lines are being extended into outlying suburbs such as Puchong and Subang Jaya. The Klang Valley Integrated Transit System, as of now, are currently being upgraded to become fully-fledged mass rapid transit systems with the construction of three new Klang Valley MRT lines that are respectively being built from the southeastern suburb of Kajang to the northwestern suburb of Sungai Buloh, as well as Putrajaya and through Kuala Lumpur itself. Buses that operate around Klang Valley is also extensive. ^ Ooi Keat Gin (2009). Historical Dictionary of Malaysia. Scarecrow Press. pp. 157–158. ISBN 978-0810859555. Archived from the original on 2015-06-04. ^ "world gazetteer". Archived from the original on 2012-12-05. ^ "World Gazetteer: Malaysia - largest cities (per geographical entity)". world-gazetteer.com. 9 February 2013. Archived from the original on 9 February 2013.